Heat oven to 350° F. Spread 1 Tbsp olive oil in bottom of baking dish. Add chicken tenderloins. Lightly cover tops of chicken in olive oil and sprinkle with chipotle seasoning, pepper and salt. 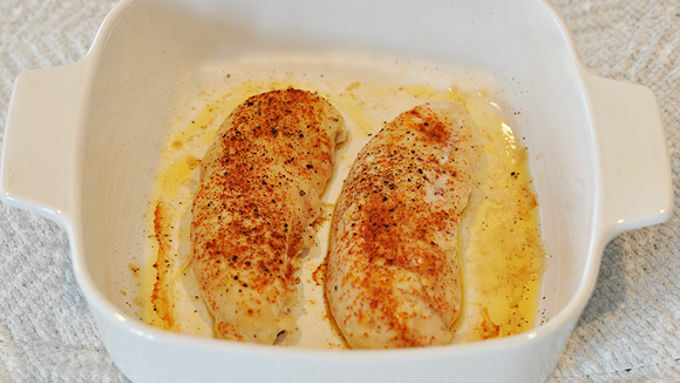 Bake at 350°F, uncovered, for 30 minutes or until chicken is thoroughly cooked. Remove from oven and let sit for 5 minutes for juices to absorb. 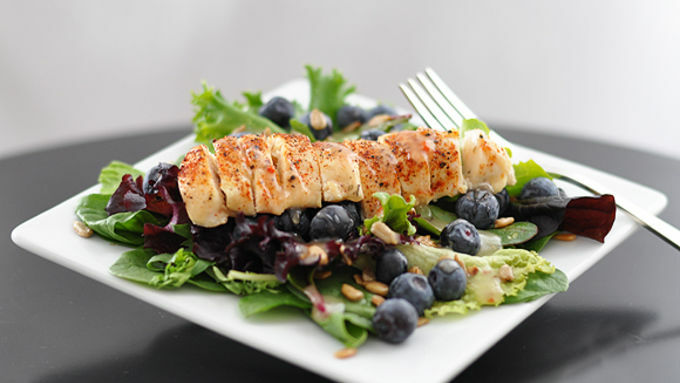 While chicken is resting, prepare plates with spinach and lettuce, dividing the greens between the plates. 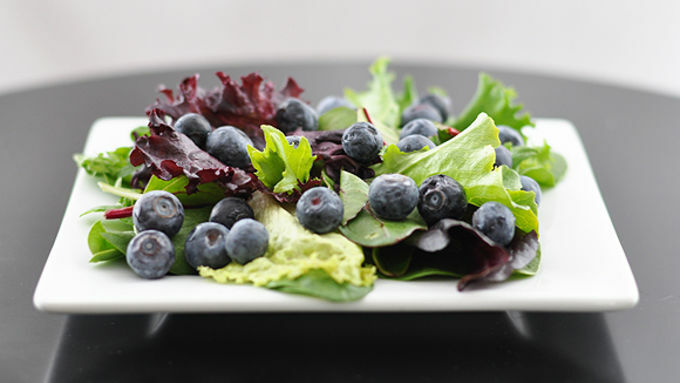 Sprinkle blueberries and sunflower seeds over greens. Slice each tenderloin into thin strips. Place one warm, sliced tenderloin over each salad. Drizzle with salad dressing, or serve dressing on the side. Serve immediately. This salad is great with chilled chicken too, making it an easy make-ahead meal. Bake and chill chicken. Slice and assemble salad as above. Great with a cup of soup, biscuit or bread stick. To make into a fuller meal, use 2 (8 oz.) boneless, skinless chicken breasts instead of the smaller tenderloins, and adjust amounts for other ingredients accordingly. 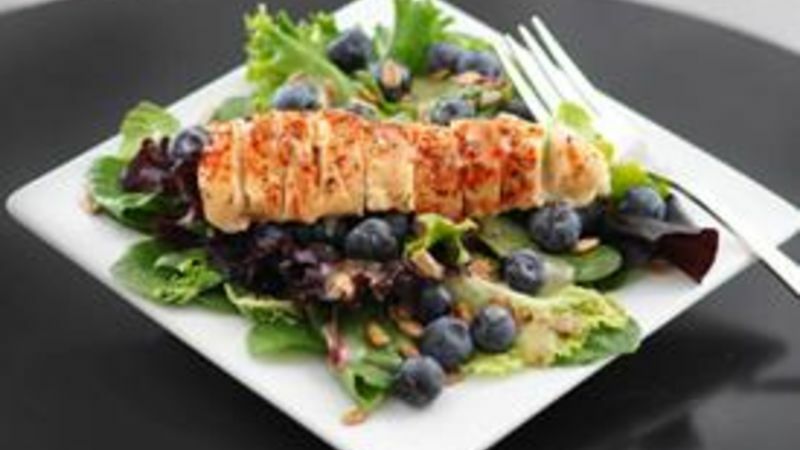 With bursting blueberries, crisp greens, salty seeds and spicy chicken -- this salad is one tasty hello to spring! All winter, seems like everybody wears shades of black and gray. Ever notice that? And all winter, foods seem just a bit more packaged, a tad more bland and a little, well, predictable. But it's like we're on the highway and can see the faster speed limit sign just ahead -- time to shift into 5th and jet into spring! This Chipotle Chicken Leafy Salad is a great way to wake up your taste buds and get 'em all excited for the fresh flavors coming their way. It's got a mouthful of everything your body's been craving since last summer. I like tangy champagne vinaigrette that I found refrigerated right near the salad fixin's at the store, but you can use your favorite salad dressing or make your own. Flavor packed! Doesn't this make your mouth water? Serve it right away -- cuz your tastebuds have seen that new speed limit sign and they're rarin' to go! The chicken can be served chilled, too, so you can make this entire dish ahead of time and pull it out of the fridge at serving time. This salad is perfect as a light meal. To make it more filling, serve with a cup of soup, biscuit or bread stick. If you want larger portions, use two 8-ounce chicken breasts and increase the amount of the other ingredients accordingly.